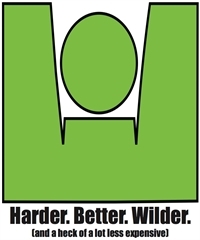 Wilderman Full: 2.4 miles of swimming, 113.4 miles of gravel grinding, mountain biking and stream crossing, and 26.7 miles of the gnarliest trail running in the state.This is an epic race. Please--before you decide to do this race read the race reports from previous races. Go in to this baby with your eyes open... If you thought IRONMAN™ (or even XTERRA™) was the end of the road - the big enchilada - the pinnacle of multi-disciplinary solo effort endurance sports - think again.